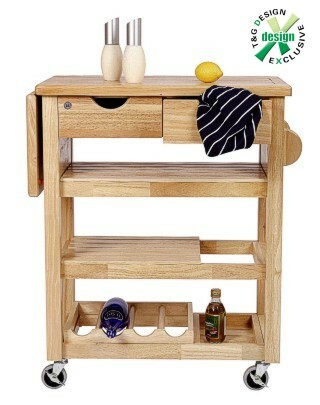 A large functional trolley featuring a 30mm thick worktop and hinged board adding an extra 30cm (12 inches) to the work surface. It has two generous slatted shelves including space to stand bottles, a built-in enclosed knife block, hand rail/towel rail, two drawers for storage and a four bottle wine rack. On four wheels, two of which are lockable its size is 76 x 42 1/2 x 91 1/2 cm high (30 by 16 3/4 by 36 inches approx) with the side board down and it is made from eco-friendly hevea hardwood. This trolley is delivered fully assembled.